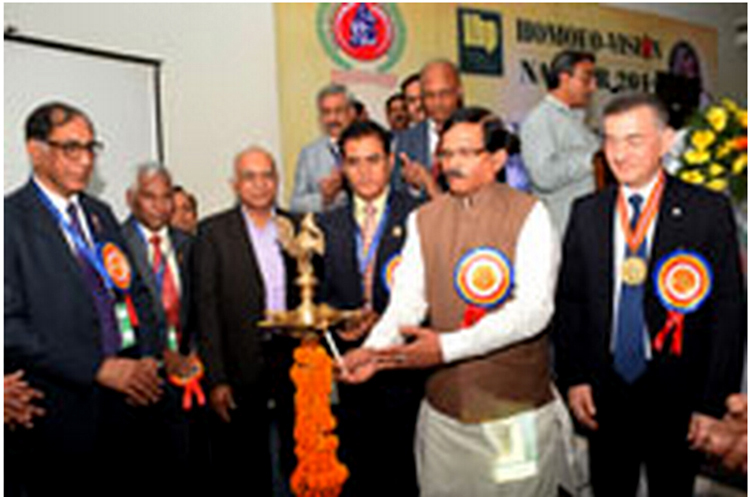 NAGPUR.FEB.13: The twenty fourth National Homoeopathic Congress ‘Homeo-Vision 2016’ was inaugurated by the Minister of State for AYUSH (Independent Charge) and Health and Family Welfare, Shri Shripad Yesso Naik at Nagpur. The Indian Institute of Homoeopathic Physician (IIHP), Maharashtra State Branch, Nagpur has organized this two-day National conference to discuss the recent advances in technology, innovative research and quality education in Homeopathy. Inaugurating the conference, Shri Shripad Naik appreciated the contribution of Indian Institute of Homoeopathic Physician (IIHP) to the cause of development of Homoeopathy in India. He expressed happiness over the fact that more than 500 Homoeopathic practitioners and educationists from all over the country are participating in this national conference. On this occasion he opined that Homoeopathy is well assimilated into the ethos of Indian heritage and it is widely accepted by the public for many of their health care requirements. He also informed that 10 % of the population depends on Homeopathy for their health care needs. While highlighting the research field in Homeopathy he said that several institutions are now showing keen interest to undertake research in Homoeopathy and Central Council of Homeopathy (CCH) and Central Council for Research in Homeopathy (CCRH) under Government of India are encouraging Education and Research in Homeopathy. Credibility and acceptability of Homoeopathy will increase if scientific validation of the principles and practice of Homeopathy is undertaken, he stated. He also underlined the vital role of Homeopathy in one of the strategies envisaged under National Health Mission for providing accessible and affordable quality health services to the poorest households in the remotest rural regions. Reduced Maternal Mortality Rate, Infant Mortality Rate and Total Fertility Rate are some of the noticeable outcomes of Homeopathy in NRHM project, he informed. He also stressed upon the objective of Ministry of AYUSH to develop the four core areas such as education, research, drug development and health care delivery. He appealed to all professional bodies to organize state level and district level seminars and road shows on World Homeopathy Day, 2016 across the country in order to make it a mass movement and to create awareness on the strength of Homeopathy in all districts, talukas and villages. To mark the inauguration of 24th National Homoeopathic Congress ‘Homeo-Vision 2016’ a special postal stamp and souvenir was inaugurated at the hands by AYUSH Minister. On this occasion, Dr. M.P Arya, Professor, D.S. Homeopathy College, Pune received ‘Prestigious Padmashree Dr. K.G. Saxena lifetime achievement award’ from the Minister for his outstanding contribution in the field of Homeopathy. Dr. Virendra Kumar, Director, ISRO, Ahmedabad informed about the facility of tele-medicine being provided by ISRO with the help of Ministry of AYUSH to access the far-flung areas of the country for consulting with homeopathic medical aid. Dr. V. K. Gupta, Dr. R.K.Manchanda, Director General, CCRH, many delegates and practitioners, medical students were present at the inaugural session.